Become aware of your daily physical activities and start to increase your fitness and health step by step. It has been proven that a more active lifestyle leads to a better health. Activ8 Physical Activity Monitors provide useful and detailed feedback on your physical activities. Track your energy consumption with great accuracy. Accuracy is important as a slight inbalance in energy intake expenditure leads over time to weight problems. Activ8 has been validated by leading medical research institutes. Activ8 Physical Activity Monitors automatically classify your activities. See when and how long you were sitting, walking, cycling or running and make a personal plan with concrete targets to change your lifestyle. Each client has their own personal dashboard that provides fundamental insight into someone’s daily activities. 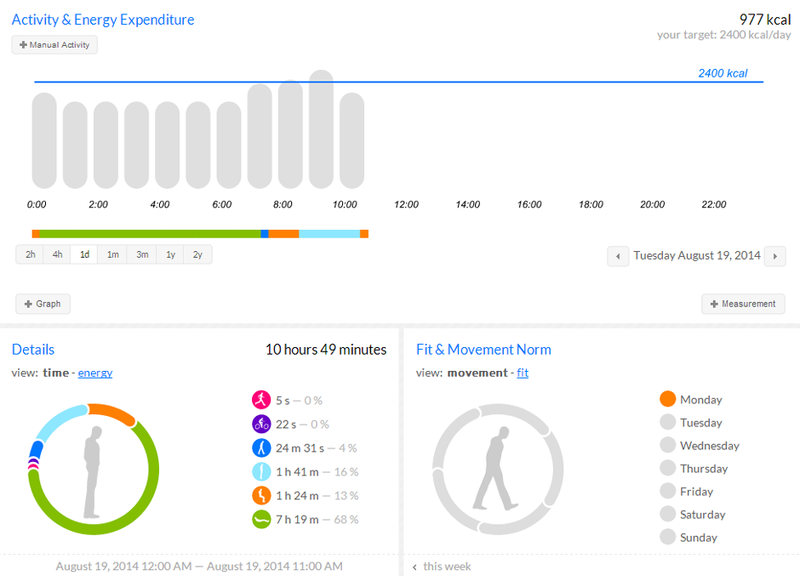 Track you activity levels, energy burned, sleep time and get detailed insight in activities you did during the day. Detailed graphs provide overview over longer periods of time and valuable, detailed insights about specific movements. This objective information increases your awareness about your own physical (in)activity. Create a personal plan with concrete and personal goals on energy expenditure, walking, cyling or running time or distance. Your dashboard contains information regarding your daily and weekly activity scores, ranking and personal plan. Instead of just providing plain activity level graphs, you can instantly see if you are leading an active or more sedentary lifestyle. You can explore and get clear insight into your daily activities and where it’s easiest to improve your routine, so you can work towards a more active and healthy lifestyle. Create a personal plan with daily kcal targets that fit your daily routine. When you achieve your daily target every day with ease you or your coach can increase your targets and step by step work towards a more active daily routine. Interested to see more detail? Just press the show summary button and you get a detailed overview over the last weeks. Besides a kcal target you can also set a target for certain activities like walking, cycling or running. Your target is to walk for at least 20 minutes each day. Your Activ8 measures on a second by second basis if you have reached your target already. Besides time you can also set a target on a certain distance your want to achieve each day: cycle at least 15km per day. It is up to you. Detailed overview on the past year, month(s), day or hour? No problem with Activ8. Besides the energy consumption in kcal you can also see what you were doing. When and till what time were you sleeping, what part of the day have you been sitting, walking, cycling, running? 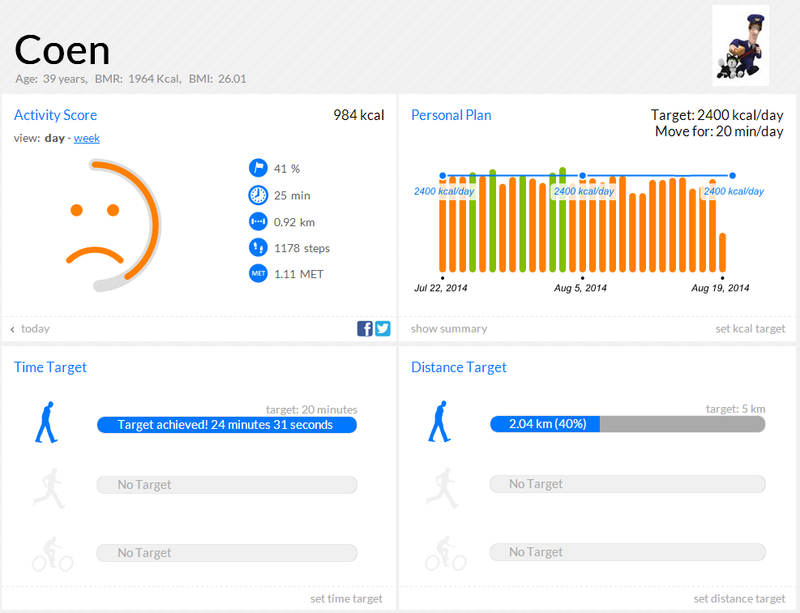 Activ8 gives a detailed view on your activities and movements. Did you forget to wear Activ8? No problem you can later always add activities manually. Just press the Manual Activity button and you can select if you forgot to wear your device or if you did a special activity. You can change the display if you also want to always see your weight or blood pressure. Just press the Graph button to add a graph. By pressing the Measurement button you can manually add these measurements: has your weight gone down, enter it. Both norms are frequently used in the Netherlands. Movement norm – do a workout of moderate intensity (> 2.5 MET) for 30 min. at least 5 days per week. Fit norm – excersize at high intensity (> 4.0 MET) for 20 min. at least 3 days per week. 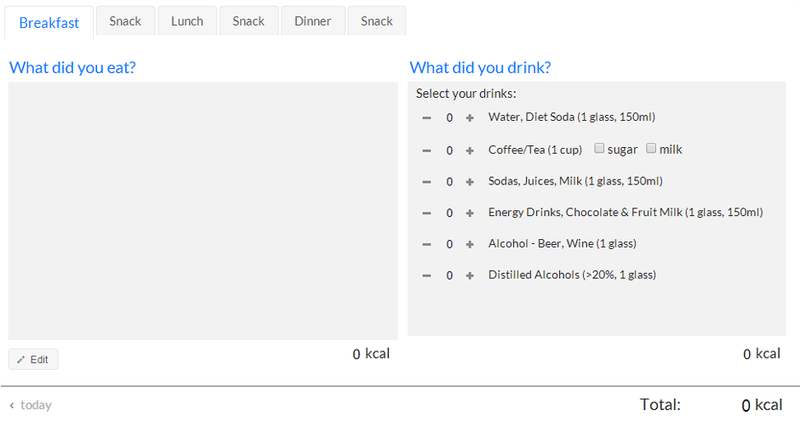 With Activ8 you can also track what you eat and drink. This can be handy when you try to loose weight. Activ8 intentionally made entering food and drinks as simple as possible to get a good high-level view over a longer period of time and not become totally calorie obsessed.